Hi there! I've given in, it's so cold here that it does really feel like winter, and that means it's time for winter designs!!! I made these fun pine cones and I actually like how they turned out. They were also very easy to make so I have a video tutorial! Yay! Click to see more pics! The story behind this is interesting. 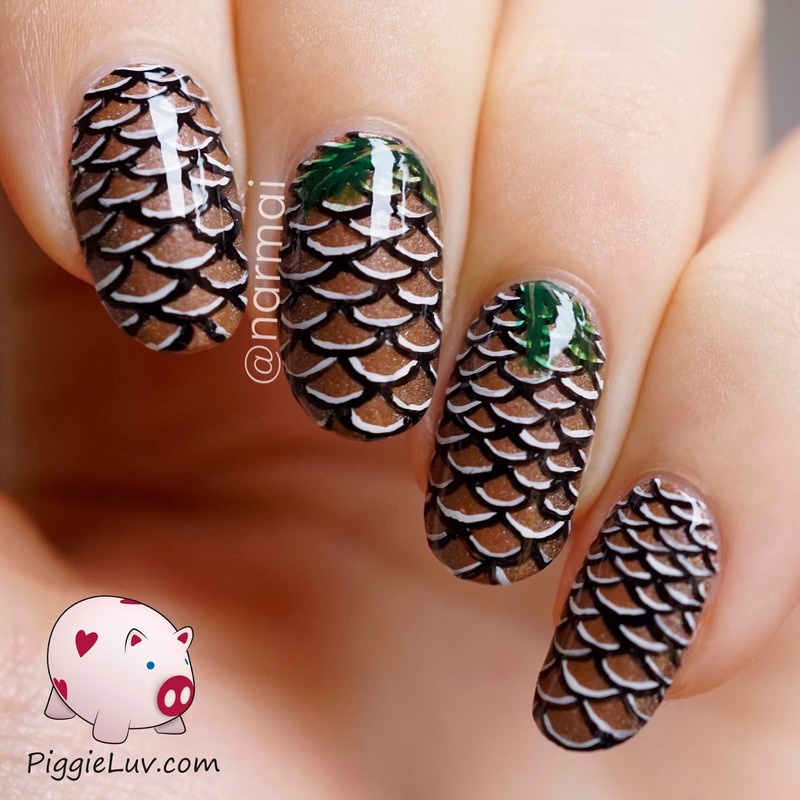 I did some mermaid scale nails a while back and I included a video tutorial. The sister of one of my friends was inspired by it and made her own version. She's on Instagram as @thehungercat. In her version, the scales were flatter. Plus, she has a pointy nail shape. 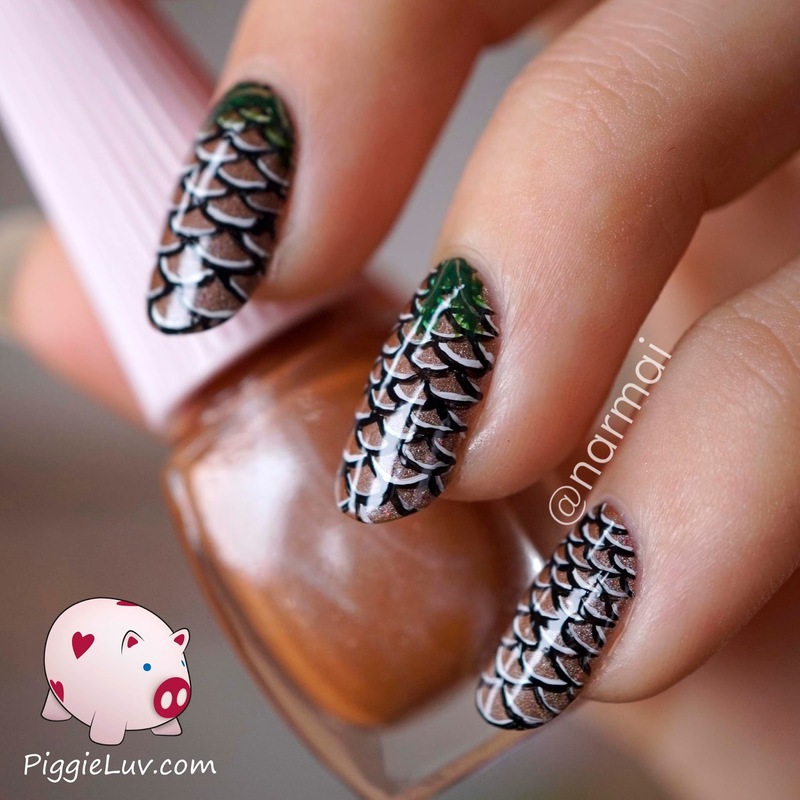 All of this combined made me think of.... pine cones! So this design is inspired by a design which was inspired by me! It's nailception! 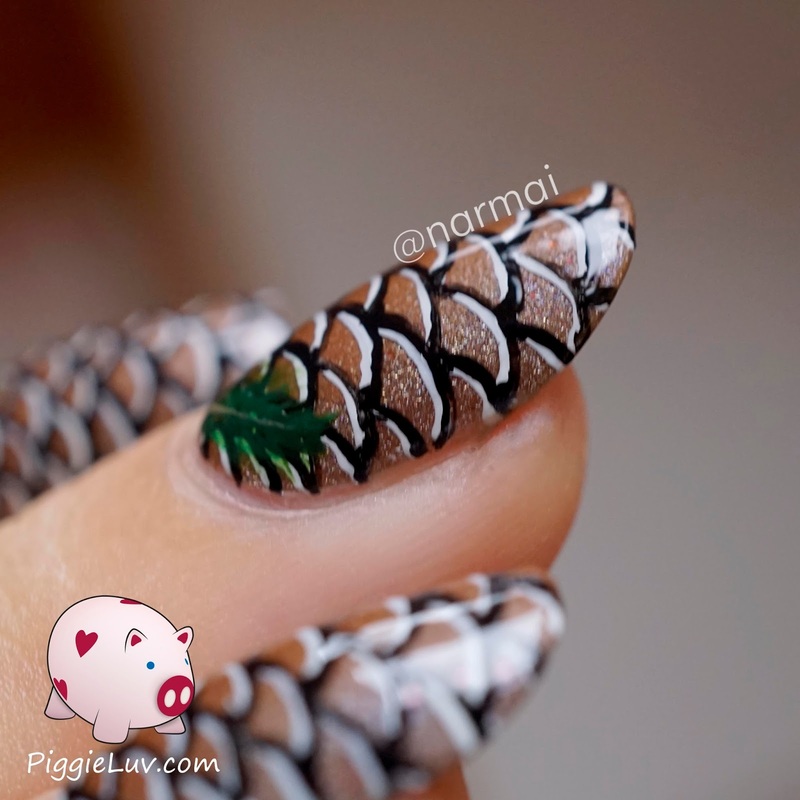 I didn't get the same flat scales as my inspiration, but it did start to look like pine cones, especially when I added the green branches on top. I used Aliquid Lacquer Dogged and Parrot Polish Chocolate Waffles for the base. I painted the rest using acrylic paint and my Basic One Gold detail brush from Christrio Scotland! I also have a tutorial for you guys, since this was really easy to do and I think you'd like it. Be warned: it needs some time. And patience. But it's really easy and fun and it relaxes me! Here's how to make this: apply the brown polish first, and let that dry properly. Then loosely apply the other color in a strip over the nail, to add a bit of depth. Put a top coat over it to make it smooth, and let it dry. Paint the scales as shown in the video. Do them with white first, and go over it with black but let some of the white show. This way, it will start to look like snow. Add some branches at the top for detail. Apply top coat and you're done! I received Parrot Polish Chocolate Waffles and Aliquid Lacquer Dogged as a press sample for an honest review. Opinions expressed are 100% my own and not influenced in any way other than the quality of the product itself.